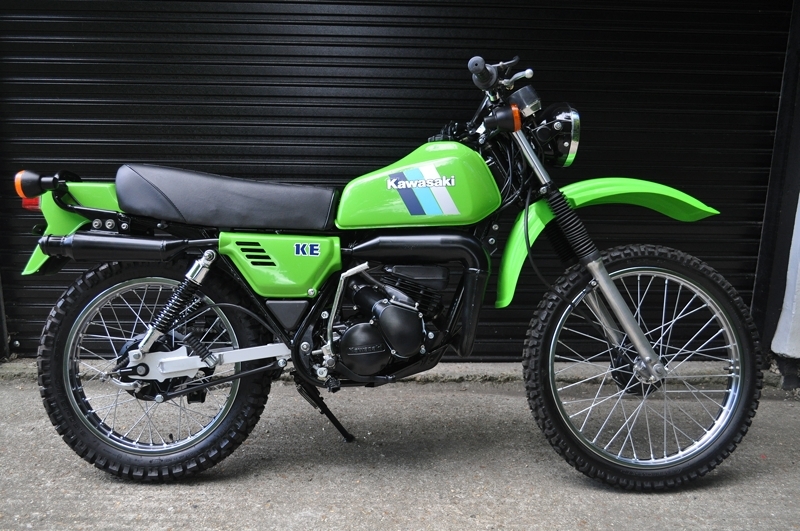 Lovingly restored in 2015, this classic KE125 is now part of a growing collection of 70's trials bikes and 80's roadsters. This 1986 classic Kawasaki KE125 was the later A12 version with the modern tank style, built with the same engine as its predecessor. Kawasaki adopting the rotary valve induction system, rather than reed induction favoured by its competitors - therefore, power output was well up at 13.5 BHP, wide powerbands with perfect gearing made this bike pull like a train. The Kawasaki has a unique engine sound due to its rotary valve which was not as popular in its day. 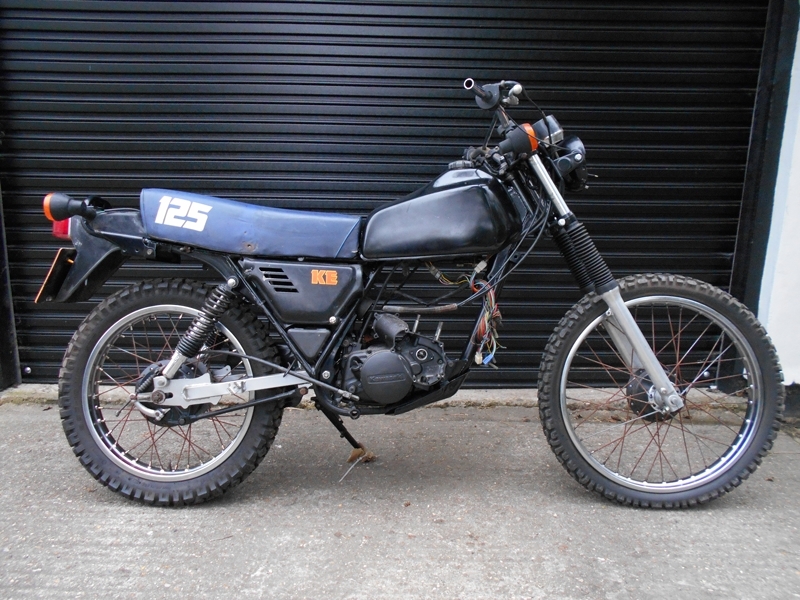 Consequently, the KE125 has become a fairly rare bike, most being scrapped for parts rather than being re-built. Many survive in the United States where they continue to be very popular. "KE" and similar models were mainly produced for the American market, where they soon became popular with students and the younger generation. Over time, the later generations (like our A12), had evolved from full-blown dirt-scramblers to daily commuters in a short number of years. With the growing market in daily commuters and declining sales in off-road vehicles - the model soon evolved to what the people wanted... a more "comfort-oriented" ride with lower seat height and a heavier raked front end that improved handling and stability - with the same off-roading capabilities as seen before. The KE range soon died off in 1998 with new emissions laws, not surprising with the bike burning a whole tank of oil (1.5 Litres) in under 60 miles, implementing its aggressive oil-injection system pumping through its Mikuni Carburettor. This seemed to be the final straw for the KE range having already just been modified to adapt with changing times and modern laws: the introduction of headlights, taillights and indicators for example - just to keep up with the Department of Motor vehicles (USA) and safety regulations of the era. With all this fascinating history, we decided to re-build this bike from the frame up and to re-finish it in Kawasaki Verdi, the classic colour with original transfers. KE tanks are prone to rusting from the inside out, thanks to the ethanol added to modern fuels. Whilst our tank was is good condition, we lined it anyway to ensure trouble-free running for years to come. The rest of the bike was refurbished in a similar way with all parts meticulously refurbished, creating what you see in our photos today... Retaining some of it's best features like the "Running in/Redline" sticker on the dash. With the use of high-quality replacement parts and all consumables swapped out, this bike will have the edge over any of its competitors met on the track or in the fields. 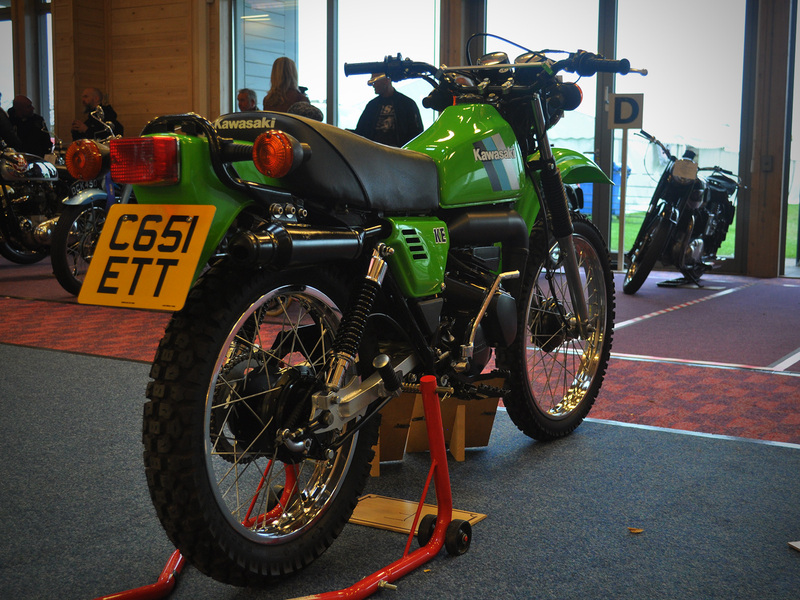 Chunky "off-road", road legal tyres had to be used to go with the whole ethos surrounding the dirt-bike scene. The lightweight construction of the bike meant that it handles fantastically on Tarmac as well as rough terrain, with good build quality and years of "Off-road" development means that Kawasaki could produce an all round fantastic motorcycle that could be enjoyed by multiple markets - including collectors of today! The engine being fit and strong to start with, showing just under 7900 miles, we decided to go ahead and fulfil a top end rebuild with new rings and replacement little end bearing to ensure the best "new start" in life after our restoration. From the new spokes on the re-built rims to the refinished engine and slick exhaust lacquer, this machine could be less than 6 months old. With the new partnership with Team ZX1 and their EXTRALUBE range, this KE125 soon became a test piece to try out the whole range of lubricants, treating the oil reservoir with the flagship "Metal-Treatment" it soon became apparent that a drastic reduction in engine noise was apparent (Especially in the rotary valve, renowned for being noisy), cables were treated with "Pin-oiler" and service items changed out with the high-temperature grease, modern technology in this bike for sure!! We then went on to proudly represented this bike at the 26th Copdock Motorcycle Show 2017 where it received some great feedback from the public... endorsing "Team ZX1" products, and sharing our experiences with their product range to budding enthusiasts. Not too long after this event, the KE found itself the latest addition to a private collection.